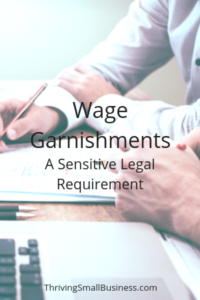 I was exposed to wage garnishments at this early age and was required to submit paperwork to have money withheld from an employee’s paycheck when the organization got notice of a garnishment demand. This was difficult as my heart ached for these employees. Many were young and didn’t make a lot of money. But what was more difficult was when the angry employee came storming to our office on payday. Fortunately I was at the bottom of the rung so a higher manager had to deal with the upset worker. That experience was a life lesson for me. One to pay my bills on time but I also learned that sometimes these garnishments are the result of situations that honestly are out of a person’s control. All that said, employers do have a legal obligation to comply with laws that mandate garnishment practices. We are fortunate to be in a strong economy but employers are required to deal with employee wage garnishments. This unfortunate situation causes embarrassment for the employee and additional paperwork for the employer. I think it is safe to say that no employee is excited about getting their wages garnished. ◊ Title III, of the Consumer Credit Protection Act, protects anyone who receives earnings of salaries, wages, bonuses, commissions or any other income. ◊ Title III protects employees from being terminated for garnishment of one debt and limits how much of an employee’s earnings can be garnished. ◊ The Act does not prohibit employee discharge because of garnishments of two or more debts. ◊ Garnishments are deducted from “disposable earnings”. Disposable earnings are earnings after all federal, state, local and social security taxes are deducted. ◊ There is a maximum amount that can be garnished in a work week. This amount is either 25% of the disposable earnings or 30 times the minimum wage ($7.25), whichever is less. ◊ The Act allows up to 50% of disposable earnings to be garnished for child support or alimony, or 60% if the worker is not supporting another spouse or child. ◊ Garnishments up to 15% of disposable earnings can be made for debts owed the government. ◊ Garnishments up to 10% of disposable earnings can be made for defaulted student loans. Let’s be real. There is not much that is more embarrassing that knowing others are aware of a wage garnishment. Information about an employee’s garnishment should be restricted to a “need-to-know” basis. In other words, only those employees who need-to-know about the garnishment should have access to the information. This may include the person in accounting who processes the garnishment or anyone who is in communication with the court or attorneys administering the garnishment. Other employees, including the employee’s supervisor, should not have access to this information unless there is a legitimate need-to-know. Garnishments can be a result of past due child support, changes in financial income but often it is the result of poor money management. Sometimes an employee finds themselves in a difficult situation and simply needs help with a personal budget. Look for free budgeting tools you can offer for the employee to help get them started. Sometimes they need a financial counselor to help them devise a plan. Either way try to be respectful of how you provide this help and allow the employee to save face by confidentially protecting their privacy. Not every employee will be open to help but for those that are, it can result in a positive long-term impact. Wage garnishment is typically not a one time event. It can take months or even years for a debt to be paid. Try to maintain communication with the employee as the debt goes down. Keep the employee in the loop on the process of payments, especially if multiple creditors are being paid. These sensitive, yet informative conversations, can be reassuring to the employee that there will be an end. We all go to work and are rewarded on payday. Employees who see their take home pay reduced for garnishments can experience frustration, embarrassment and can become discouraged. Take the time to help your employees by protecting their privacy, helping them with financial issues and supporting them through the process. These simple steps of kindness can go along way to help an employee who may have simply fallen on hard times. For more information on wage garnishments, visit dol.gov or contact the US Department of Labor at 1-866-487-9243.